Swapping out paper towels for hand dryers is as sustainable a move as it is a cost-effective one in the long-run – you save on the need to constantly stock up and replace paper towels, which, invariably, do get wasted a lot of the time. Paper towels are generally made of plant material, so opting for a hand dryer correlates to reduced pressure on our natural resources. And with an increasing number of dryers these days engineered to save energy and dry swiftly and efficiently, they are a more environmentally friendly, cost-efficient solution as well. Here are our picks for the best hand dryers you might wish to invest in, to install for your office-, school- or other publicly accessible restrooms. With a durable, rust- and wear-resistant thermoset polymer cover, this dryer is designed to get all the moisture off your hands in 10 to 15 seconds, cutting down on waiting time and perfect for accommodating community washrooms used by several people at a go. While the degree of air velocity of dryers is usually directly proportional to the amount of noise they make, this dryer comes fitted with a 1.1 noise-reduction nozzle, which can cut down on potentially deafening blasts of air by up to 9 decibels. The dryer is easy to install, with a convenient design that lets you mount it up against the wall, and is also automatic – it only switches on when you place your hands directly underneath the air outlet, making it both energy-saving as well as hygienic since you don’t have to touch it to turn it on. Operating at 277 volts, this dryer is a guaranteed energy-efficient and eco-friendly alternative to paper towels, meeting GreenSpec standards as well as scoring credits for energy saving and waste reduction under Leadership in Energy and Environmental Design (LEED). With a sleek, sophisticated design that makes this an attractive addition to any washroom, this dryer comes with a brushed stainless steel cover that not only looks great but also resists rust and damage. Powered at 110 volts, this high-speed dryer does its thing in 10 seconds or so, making it much faster than the previous generation of slow-drying devices with its narrower outlet diameter and subsequently higher air pressure and velocity. It’s also fitted with a noise reduction nozzle, clocking in at 70 to 72 decibels when activated. With a roughly 3 feet long cable to plug into a power outlet, the hands-free dryer is activated when sensors detect your hands within 5 inches under the dryer, avoiding getting accidentally triggered and wasting energy. The device comes with a template to let you affix it to your desired spot on your washroom wall, with a power-drill, screw gun and the nails and dry-wall anchors included all you’ll need to set up. This device can dry up your hands in up to 10 seconds without any heat element involved. 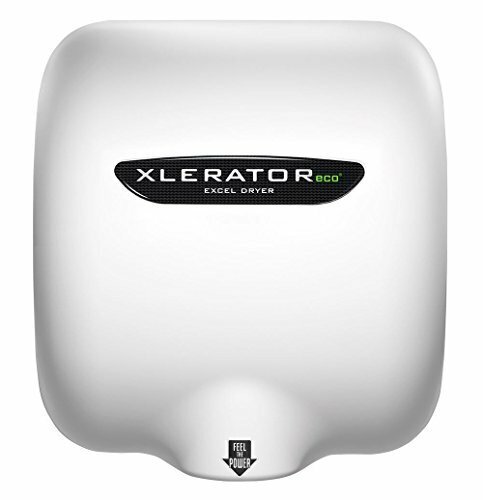 With an air drying component that uses significantly less energy than many hand dryers on the market, this is both a cost-effective option to choose for your office or school restrooms as well as an energy-saving and environmentally-friendly one. The dryer comes with a wear- and tear-resistant polymer cover and is designed to be hard-wired into position for surface mounting, requiring only 500 watts of power to gear up. It also comes with a 1.1 noise reduction nozzle to slightly lower the racket a high-speed hand dryer is expected to make. 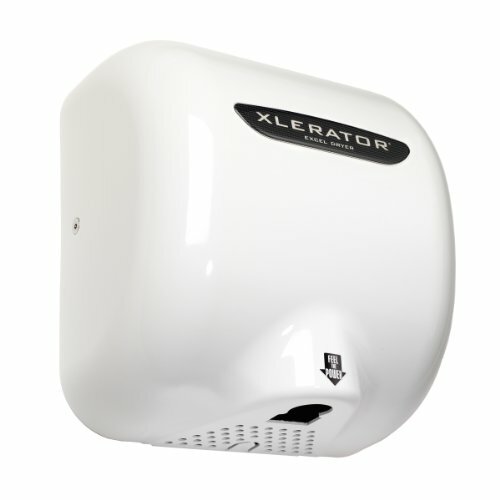 With a sleek, metallic-looking design structured out of the highly durable and damage-resistant acrylonitrile butadiene styrene (ABS) plastic, this dryer emanates an air of both clinical hygiene as well as the top-of-the-line sophistication you would want a public restroom in an office space or lobby to have. Not only does it dry up your hands within 10 seconds, give or take, but it also leaves them cleaner – a heavy-duty absorber filter works to get rid of over 99% of germs per 0.3 microns of air, leaving you with dried up and sanitized hands. Fitted with a 1.1 noise reduction nozzle to keep the noise down, the motor is also engineered to be as quiet as possible. With a 350-watt heating power, this is an energy-saving, hands-free device simple to mount up on a wall close to a power outlet you can plug it into. Initially, hand dryers tended to take too long to dry, making them somewhat inconvenient – as well as excessively energy-consuming – devices to invest in. Today, though, several models on the market have capitalized on the need for hand dryers to work faster. The best ones will dry up any moisture from your hands within 10 to 15 seconds, cutting down on waiting time and not risking a queue building up behind you while it’s your turn at the dryer. The shorter drying times mean less energy, especially with several models being designed to be as energy-efficient as possible, thus cutting down the need for constantly purchasing and re-stocking paper towels which otherwise pose pressure on our limited natural resources – as well as our budgets. Though dryers with higher air speed and force tend to be louder, there are a few models out there fitted with noise reduction nozzles to take the edge out of the racket. Another critical feature to look for in a hand dryer is an option that is hands-free, activating when sensors detect your skin within a specific range of the dryer. This is not only energy-saving, since it ensures the dryer doesn’t switch on when it isn’t needed, but also hygienic, since you don’t have to touch a device in a shared, public space prone to be breeding-grounds for bacteria.